The influential Commons Home Affairs committee of MPs has said it has "deep concerns" about evidence it was given by London mayor Boris Johnson. Its chairman, Labour MP Keith Vaz, has written to the Tory mayor saying the committee was also concerned about the "level of respect and courtesy shown". Mr Vaz accuses Mr Johnson of giving four different accounts of events ahead of Tory MP Damian Green's arrest. Mr Johnson has now written back to Mr Vaz to provide more details. He said he had fully co-operated with the committee and regretted suggestions to the contrary. The committee hearing last week saw the London mayor - who also heads the Metropolitan Police Authority - pressed over when he first spoke to Conservative David Cameron about the arrest of Mr Green during a Home Office leaks inquiry. As chairman of the police authority, Mr Johnson was told about the arrest in advance, but he insists he only spoke to Mr Green and his party leader David Cameron after Mr Green's arrest. He told the home affairs select committee he had a "perfunctory" conversation with Mr Cameron at about 1500 GMT at the service for murdered teenager Damilola Taylor at Southwark Cathedral on 27 November, the day of the arrest. But after giving evidence to the select committee, Mr Johnson is understood to have recalled that he had spoken to Mr Cameron by telephone three hours earlier than their Southwark Cathedral encounter. Committee chairman Keith Vaz wrote to Mr Johnson to ask him to clarify his account. In his letter, Mr Vaz said: "After the completion of the session you approached me and told me that you had contacted David Cameron earlier at 12 noon and you mentioned the words 'Ladbroke Grove Station'." He asked if there was any further evidence Mr Johnson wanted to put before the committee. 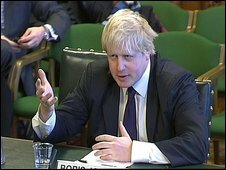 In response, Mr Johnson said that his phone records for that day showed that he spoke to Mr Cameron at 1359 GMT. "Please be assured that I mean no disrespect to the committee and I made a special effort to attend last week on a busy day and to get these phone records for you as soon as possible," he said in a letter to Mr Vaz. He added that he hoped "this concludes the matter". Mr Johnson's spokeswoman said that the mayor had "gone out of his way to co-operate fully with the committee". Referring to his appearance before the committee, she said: "When he was asked about the timing of a phone conversation with David Cameron, the Mayor made it clear this was a perfunctory discussion which took place after Mr Green's arrest. "The Mayor was unable to recall from memory the exact time of the phone call and told the committee he would check. "He did this straight after the session ended and immediately told the committee chairman. Mr Vaz requested the information in writing and the Mayor regards it as unfortunate that, before he could respond, Mr Vaz suggested via the media that the Mayor had been uncooperative. "When it became clear the committee wanted a more detailed account of the timing of the phone call, the Mayor instructed his staff to obtain his phone records." This did "not in any way alter the evidence" given by the mayor, she added. Mr Green, the shadow immigration minister, was arrested as part of an inquiry into leaks from the Home Office. He denies any wrongdoing.